ESA astronaut Paolo Nespoli (left) and fellow Expedition 52/53 crew mates Sergey Ryazansky of Roscosmos (centre) and Randy Bresnik of NASA (right) arrived at Baikonur cosmodrome on Sunday, 16 July. With just under two weeks to go to launch, the crew will perform a series of tests and ceremonies. In addition to a Sokol spacesuit fitting, the crew visited their Soyuz MS-05 spacecraft for final checks. 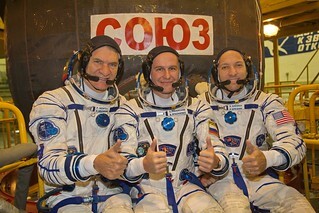 Launch is set for 28 July from Baikonur Cosmodrome in Kazakhstan. Read more about Paolo's VITA mission here.